Which should not be terrifying whatsoever. Basically the light means that the car’s computer has identified a concern in the system that requires attention. What sort of attention? Professional attention, from a professional technician. It requires having the computer system scanned and checked to identify any parts that have shifted beyond the standard performing range. Sounds complicated, but actually that light is just the computer’s method of informing you to have your car checked. It located a problem– usually one that you wouldn’t even notice during normal driving– and it requires to be inspected before it becomes serious. Why does the system require a Check Engine light? Because the more complicated the system is, the more it has to help you monitor its performance and diagnose problems. And the computer system on today’s cars is highly complex. Therefore the system is developed to monitor operation and set codes when it identifies a problem. Most of the time a Check Engine light indicates a problem that’ll increase emissions. And those emissions don’t have to increase a lot to turn the light on: Today’s cars are produced to run a lot cleaner than those of just a decade ago. But even if you don’t really care all that much about your car’s environmental impact, a Check Engine light is still something you’ll need to have inspected. Remember, anything that raises emissions probably also burns more gas. And at the price of gas today, that’s not something you want to ignore. What’s more, pumping additional fuel through the engine can force the catalytic converter to work overtime to burn off the extra carbon monoxide and hydrocarbons. That can overheat the catalytic converter and burn it out in just a few miles. And changing the catalytic converter could be an expensive repair you’ll need to take care of before you’ll be able to pass your next emissions test or smog test. Allstate Auto Experts is equipped with the latest test equipment for diagnosing today’s computer systems. We’ll be happy to scan your car’s computer system and check for any codes stored in memory. And their technicians can examine the circuits and systems to locate any problems, and bring those systems back into proper operating condition. High-tech computer controlled emissions devices are now a big part of exhaust service. Because it is so sophisticated, your vehicle manufacturer recommends you have your emission system checked out by a qualified exhaust technician regularly to make sure everything is working right – usually every 6 months or 10,000 miles/16,000 kilometers.If your Check Engine light comes on, especially if it’s flashing, get your car looked at right away. 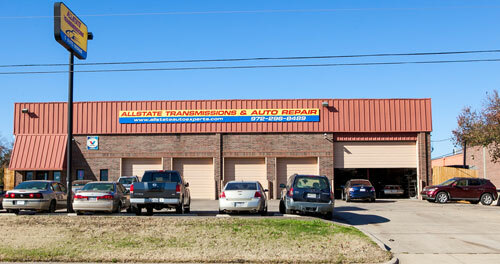 Technicians at All State Transmissions & Auto Repair handle emission problems everyday. You might have exhaust or emissions trouble if your car is difficult to start, runs rough, is noisy or smoking. Call All State Transmissions & Auto Repair at 972.296.8489 to schedule an appointment if you experience these problems.